For reliable information transfer between your devices – reliable RMG communication technology. Reliable data communication between measuring instruments and computer systems is becoming increasingly important. For this purpose, RMG offers a wide range of communication modules with various transmission protocols, both in the form of devices and software. Many standard devices, such as volume correctors and data loggers, offer integrated transmission components and protocols such as serial interfaces, modems, GSM, GPRS or Ethernet as well as DSfG protocol or Modbus. Complex measuring stations with several measuring devices are often constructed as a local bus system with DSfG technology. DSfG bus access components are used for the physical bus connection of computer systems, the bus access control and the safeguarding of the measured data transmission. Depending on the task, various communication devices are available. 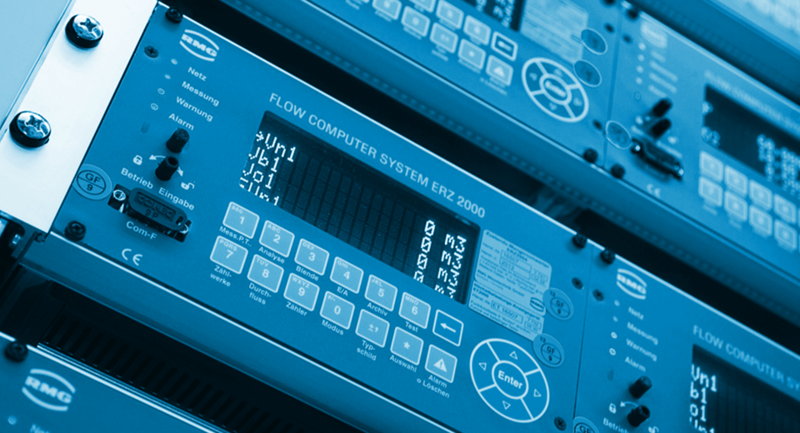 Whether gas meters, flow computers or analysis software: RMG offers you complete systems for your requirements. The individual components are combined and precisely matched to one another.